If you are looking for go pro alternative, then APEMAN Trawo is for you. This action camera is best to capture the amazing moments. I have bought this APEMAN Trawo Action camera before a month. I love this camera so much, I have written this review after using this for a month. Read my complete APEMAN Trawo Action camera Review before buying this camera. There is nothing more interesting than capturing your adventure experience as your memories that never get old. All you need is a good and stable action camera which fits in your hand so you can carry it out everywhere. APEMAN is one of the top companies that build high-quality action cameras, and APEMAN Trawo is exceptional. This APEMAN Trawo comes with 20MP that gives you a 4K resolution. It has inbuilt WiFi for easy share. The waterproof technology with 170* wide angle lens bounded with Panasonic sensor makes this action camera as the best of all. Speaking about the design, it looks like all other action cameras but with little unique design. APEMAN Trawo A100 has a unique shape that shows out how big the lens is, and the solid body around it makes it look more attractive. It has the model name on the front, and nothing else, the sleek and simple body with no fancy design makes it so elegant. On the beck, it has a two-inch screen so preview your footage. APEMAN Trawo has a considerate design with a beautiful cover to protect the card slot, USB port and HDMI port. It has a fixed battery covers so you no need to worry about losing the battery cover. It has very few dedicated buttons to record videos and capture images with its brilliant 20MP camera. You will wonder from where it produces such high premium quality video footage from this small device. APEMAN Trawo action camera delivers you 4K resolution high-quality video with crisp and sharp footage, the resolution can be adjustable for battery performance as manually like (4K in 30fps. 2.7K in 30fps, 1440P in 60fps and 1080Pin 60fps) and the 20Mp brilliant camera also captures beautiful images that store your memories and moments with crisp detailed and unparallel clarity. APEMAN always build their entire action camera with the wide lens just like that this APEMAN Trawo action camera was also built with 170* super wide angle lens. This 170* wide-angle lens helps you to capture wider and bring more memories in the frame. The lens was built with seven layers of all glass to bring down maximum quality as possible, and the lens has a UV protection film and IR filter that saves your action camera from direct sunlight and to shoot at nights. These seven layers of the lens are capable of reducing colour dispersion and correcting colour aberration. This captures stunning images and videos on everything you shoot. Speaking about the performance of this action camera we are starting with the batteries. APEMAN Trawo action camera offers you dual rechargeable 1350mAH batteries so you no need to worry about running out of battery. This dual 1350mAh battery gives you a solid 120 minutes of recording videos in 1080P, 90 minutes of recording in 4K. Both the batteries long last and helps you to capture all the event without running out of battery that eventually leads to incomplete capturing moments. These dual 1350mAh batteries make your camera long last as you do. This action camera has a built-in WiFi connection to share your files as well as to connect with the remote. You can control the camera by connecting it through the device using the free Trawo APP called ‘YUTUPRO’ in play store. You can control the app remotely, other than this you can also switch modes at any time, check out your shots and share your favourite photos or videos on the sport or at any time. The app and the remote control is simple enough for beginners to use and the connection is stable for long distance. Speaking about the camera and lens performance the lens was super wide 170* that captures everything in the frame, and it also offers three modes narrow, medium and super wide angle. The lens was bounded with Panasonic sensor that makes sure you get rich, high-quality video footage all the time. And the camera has different modes that have to be mentioned this APEMAN Trawo Action camera records video in 120fps slow motion. You will be amazed by the smooth high definition slow motion video. It gives an amazing special effect without dropping any quality of the video. This enhances the action by seeing it in shutter free, slow motion, cinematic effect and there are also other modes available to make the footage more interesting. Other than slow motion capturing you will also get stable footage without any shake with the help of Electronic Image Stabilization (EIS). APEMAN Trawo Action camera uses an advanced EIS to process the movement so that the shaking and blurring while capturing the footage in motion will be controlled as less as possible. Whether you are shooting by hand if mounting the action camera on your bike, this camera will deliver a buttery smooth footage every time. Other than this the action camera comes with a waterproof case, this underwater camera can easily dive up to 130 feet, i.e. 40 meters deep inside the water. You can always be ready for underwater adventure with this action camera and with the help of 170* super wide angle lens it gives richness to your footage and with the shooting mode, you can manually set the frame as it suits you and suits the shooting condition. 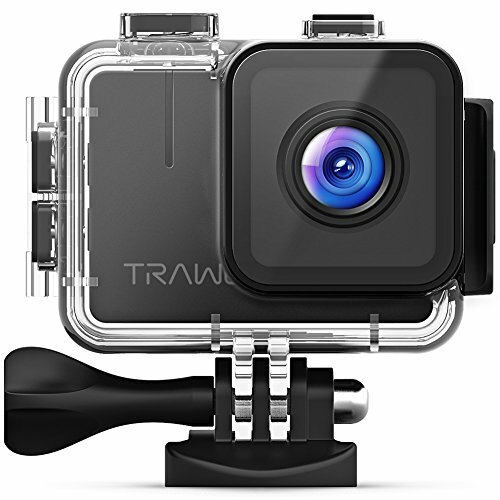 APEMAN never compromise in offering camera accessories, but in this Trawo Action camera, the company has taken the level to another step by offering upgraded camera accessories. You can capture the whole amazement of your adventurous trip in a new way with the help of 24+ Trawo mounts and accessories. All the accessories come along with the camera including two rechargeable batteries and two years of warranty from the date you purchase. This budget-friendly action camera has fulfilled all the needs of users who had bought this. APEMAN was known for giving best action cameras, and this Trawo Action camera was an upgraded version of others among the same price. There were so many positive comments about this action camera especially users have quoted about the simple design with advanced camera performance was easily noticeable in every comment. Users had stated this action camera has the best super wide angle wit brilliant camera that delivers extremely high-quality footage and photos. They also stated about the stable WiFi connection and the modes of camera that gives them a cinematic experience. Super wide 170* angle 7layer lens with Panasonic sensor. The battery takes a long time to recharge. If you are looking for an action camera that takes your footage to the next level so if you want to give a cinematic effect to your videos and pictures you can go for this APEMAN Trawo Action Camera. With a great camera and lens along with upgraded performance, this action camera is a game changer. You can also write your own APEMAN Trawo Action camera Review in the comments section.